"WYNDHAM HOTELS AND RESORTS will brand the 400-room Wyndham St. Croix Golf Resort & Casino, scheduled to open in 2010. The resort will serve as the cornerstone of a $250 million complex that will include the St. Croix Conference Center. The 294-acre site near downtown Christiansted is a short drive from the airport. The resort will have a casino (the second on the island); a Jack-Nicklaus-designed golf course; a spa and fitness center; four restaurants; lounges; retail stories; and a kids' club. The property will be St. Croix's second chain hotel, joining the Divi Carina Bay Beach Resort & Casino." SAN JUAN, Puerto Rico, Nov. 20 /PRNewswire-FirstCall/ -- First BanCorp today announced that, following the most recent Safety and Soundness examination of FirstBank Puerto Rico (the "Bank"), the Federal Deposit Insurance Corporation ("FDIC") and the Office of the Commissioner of Financial Institutions of Puerto Rico ("OCIF") terminated the Order to Cease and Desist dated March 16, 2006 related to the mortgage-related transactions with other financial institutions and the Order to Cease and Desist dated August 24, 2006 with respect to the Bank's compliance with Bank Secrecy Act ("BSA"). "We consider the lifting of the Cease and Desist Orders a major accomplishment because the action by the regulators reflects FirstBank's successful fulfillment of the requirements of both Orders. The Board of Directors and management remain steadfastly committed to maintain the highest safety and soundness standards and comply fully with the regulatory programs," said Luis Beauchamp, the Corporation's President and Chief Executive Officer. With respect to the March 16, 2006 Cease and Desist Order, FirstBank has taken the required actions, including a substantial reduction of the credit risk concentration in connection with certain loans outstanding to two large mortgage originators in Puerto Rico to levels acceptable to regulatory agencies and within parameters set forth in the policies adopted by the Corporation. In addition, FirstBank conducted, through an independent consultant approved by the regulators, a comprehensive review of its mortgage portfolio to evaluate the credit risks associated with the mortgage portfolio. The review consisted of a full credit review performed by an expert consultant, which included a review of legal documents, collateral property values, and credit and income underwriting. Furthermore, the consultants performed a loss reserve analysis of the mortgage portfolio. As previously mentioned in a press release dated November 6, 2007, the Corporation's residential mortgage loan portfolio amounted to $3.0 billion or approximately 27% of the total loan portfolio as of September 30, 2007. At that time, the Corporation's residential mortgage portfolio consisted of loans in Puerto Rico (74%), loans in Florida (12%) and loans in the Virgin Islands (14%). More than 90% of the Corporation's residential mortgage loan portfolio consisted of fixed-rate, fully amortizing, full documentation loans that have a significantly lower risk than the typical sub-prime loans that have already affected the U.S. real estate market. The Corporation has never been active in negative amortization loans or adjustable rate mortgage loans (ARM's) with teaser rates. Total residential ARM's outstanding as of September 30, 2007 amounted to approximately $190 million. The annualized ratio of residential mortgage loans net charge-offs to average mortgage loans was 0.06% for the nine-month period ended September 30, 2007. As a result of the August 24, 2006 Cease and Desist Order, the Bank has refined the core elements of its BSA Program, performed a full review of the BSA policies, programs and procedures, completed a comprehensive risk assessment of the Bank's customers, products, services, operations and internal controls, and businesses' geographic locations for BSA, expanded its training programs and reviewed its independent testing procedures to ensure full compliance with BSA. First BanCorp is the parent corporation of FirstBank Puerto Rico, a state- chartered commercial bank with operations in Puerto Rico, the Virgin Islands and Florida; of FirstBank Insurance Agency; and of Ponce General Corporation. First BanCorp, FirstBank Puerto Rico and FirstBank Florida, formerly Unibank, the thrift subsidiary of Ponce General, all operate within U.S. banking laws and regulations. The Corporation operates a total of 153 financial services facilities throughout Puerto Rico, the U.S. and British Virgin Islands, and Florida. Among the subsidiaries of FirstBank Puerto Rico are Money Express, a finance company; First Leasing and Car Rental, a car and truck rental leasing company; and FirstMortgage, a mortgage origination company. 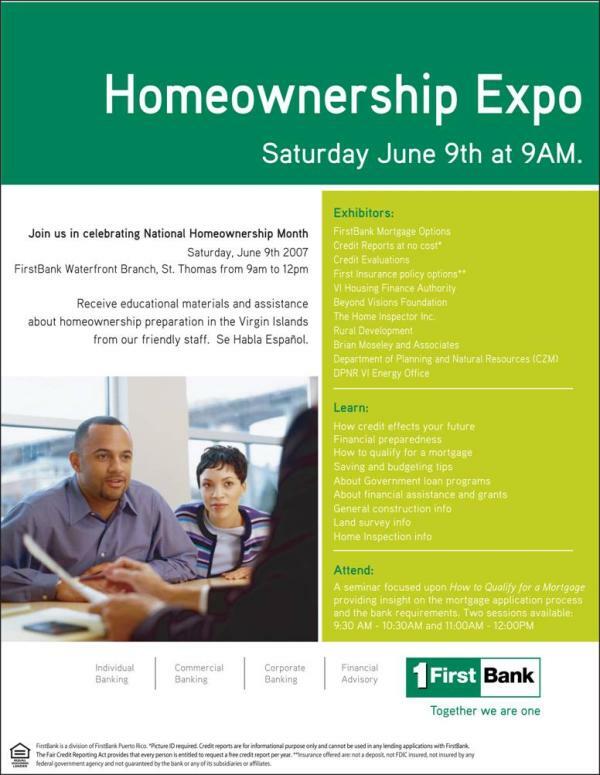 In the U.S. Virgin Islands, FirstBank operates First Insurance VI, an insurance agency and First Express, a small loan company. First BanCorp's common and preferred shares trade on the New York Stock Exchange under the symbols FBP, FBPPrA, FBPPrB, FBPPrC, FBPPrD and FBPPrE. This press release may contain "forward-looking statements" concerning First BanCorp's (the "Corporation") future economic performance. The words or phrases "expect," "anticipate," "look forward," "should," "believes" and similar expressions are meant to identify "forward-looking statements" within the meaning of the Private Securities Litigation reform Act of 1995. The Corporation wishes to caution readers not to place undue reliance on any such "forward-looking statements," which speak only as of the date made, and to advise readers that various factors, including, the deteriorating economic conditions in Puerto Rico, interest rate risk relating to the secured loans to Doral Financial Corporation and R&G Financial Corporation, the continued repayment by Doral and R&G Financial of their outstanding loans, the impact on net income of the reduction in net interest income resulting from the repayment of a significant amount of the commercial loans to Doral, the impact of the consent order with the Federal Reserve Bank of New York on the Corporation's future operations and results, the Corporation's ability to continue to implement the terms of the consent order, FirstBank's ability to issue brokered certificates of deposit, its liquidity, the ability to fund operations, changes in the interest rate environment, the deteriorating regional and national economic conditions, including the risks arising from credit and other risks of the Corporation's lending and investment activities, particularly the condo conversion loans in its Miami Agency, competitive and regulatory factors and legislative changes, could affect the Corporation's financial performance and could cause the Corporation's actual results for future periods to differ materially from those anticipated or projected. The Corporation does not undertake, and specifically disclaims any obligation, to update any "forward-looking statements" to reflect occurrences or unanticipated events or circumstances after the date of such statements. "The Strategic Relationship Agreement initially consists of approximately 7,900 homes in four countries and one U.S. Territory. Rosewood has proposed community projects in the Bahamas, Jamaica, Barbados, South Africa and the U.S. Virgin Islands. Exousia is to provide high quality structurally insulated building systems and technical expertise for worldwide deployment. Rosewood will provide real estate development services including master planning and infrastructure to create affordable planned residential communities. Exousia anticipates completion of the aforementioned 7,900 homes over the next five to seven years." ST. THOMAS, U.S. Virgin Islands, June 10 /PRNewswire-FirstCall/ -- Building on its overwhelming popularity, the nearly sold-out Ritz-Carlton Club, St. Thomas, announces today the start of sales for 24 new fractional ownership Club Suites. Sold in the same 21-day interests as the resort's current residences, first occupancy for the Club Suites is slated for this December. Construction is scheduled to commence next week for the new oceanfront suites. They will reside in two existing buildings previously part of the adjacent Ritz-Carlton, St. Thomas. Consisting of two-bedroom floor plans averaging 1,500 square feet, the 24 Club Suites will reflect Mediterranean d�cor boasting a casually elegant dining area; kitchenette with granite countertops, under-the-counter refrigerator, dishwasher and microwave; richly- appointed master bedrooms with down comforters and pillows and walk-in closets; Turkish marble in the bathrooms with cast iron tubs; full-size washer and dryer; and picturesque views of Great Bay from the balconies. Additionally, an exclusive Member-only clubhouse will provide light meals throughout the day. "The tremendous response to The Ritz-Carlton Club, St. Thomas has been exciting to witness," said William Coker, director of sales and marketing. "We already have some early interest in the Club Suites from our current Members and their friends and family, so brisk sales are likely to continue." In the tradition of Ritz-Carlton service excellence, The Club provides Members pre-arrival provisioning of their residence, dining at a variety of on-property restaurants and the privileged use of the services and amenities available at The Ritz-Carlton, St. Thomas. Located on the eastern tip of St. Thomas on a half-mile stretch of beach, the private Club provides a luxurious vacation home in paradise -- without the maintenance and responsibilities associated with home ownership. It features deeded, fractional ownership allowing Members and their guests to use a one- twelfth interest for 21 days annually. Members also have the opportunity to utilize supplemental time as space allows, and reciprocal use privileges with other Ritz-Carlton Club locations. Membership prices for the new Club Suites start at $132,000 per interest. An extension of The Ritz-Carlton Hotel Company, L.L.C., The Ritz-Carlton Club is a luxury tier, fractional ownership real estate offering combining the benefits of second home ownership with personalized Ritz-Carlton services and amenities. For information, please call 877.667.4300, e-mail stthomas@ritzcarltonclub.com or visit http://www.ritzcarltonclub.com. AN JUAN, Puerto Rico, April 19 /PRNewswire-FirstCall/ -- First BanCorp (NYSE: FBP - News), the second largest Puerto Rico Financial Holding Company, with diversified banking operations in Puerto Rico, the U.S. and British Virgin Islands, and Florida, reported today earnings for the quarter ended March 31, 2005. Net income was $53,431,802, or $1.07 per share basic and $1.04 per share diluted, for the first quarter of 2005, as compared to earnings of $40,205,034, or $0.75 per share basic and $0.73 per share diluted for the first quarter of 2004. These results represent an earnings increase of 32.9% for this quarter. Return on Assets (ROA) and Return on Common Equity (ROCE) were 1.40% and 25.44%, respectively, for the quarter, as compared to 1.32% and 21.74%, respectively, for the same quarter of 2004. Basic and diluted weighted average common shares were 40,391,489 and 41,762,565, respectively, for the quarter ended March 31, 2005. Commenting on these first quarter 2005 results, Mr. Angel Alvarez-Perez, Chairman, President and CEO of First BanCorp, said, "This has been a very good quarter overall. Our loan portfolios continue to grow, and our non-performing assets and charge offs continue to decline. Earnings this quarter include a gain on sale of investments, net of derivatives net losses, of $8.4 million. However, comparable earnings of the March 2004 first quarter included $6.7 million in special items due to an after-tax gain on the sale of a credit card portfolio of $3.2 million and gains on sale of investments net of derivative losses of $3.5 million." Net interest income, the Corporation's main source of income, increased by $21.4 million from $88.2 million during the first quarter of 2004 to $109.6 million during the first quarter of 2005. This increase is mostly attributable to an increase in average earning assets of $3.1 billion since March of 2004. On a linked quarter basis, net interest income increased $5.5 million. The Corporation was able to replace investments, which had been called during the previous quarter, with new securities. Starting this quarter, the Corporation has reclassified late charges and prepayment fees on loans, as interest income, to conform with 2005 presentation. Previously, these fees were included as other income. This reclassification varies the net interest margin ratio. Net interest margin was 3.33% for the first quarter of 2005, as compared to 3.45% for the first quarter of 2004 and 3.36% for the fourth quarter of 2004. Utilizing the previous calculation method, where late charges and prepayment fees were included under other income, net interest margin would have been 3.26% for the first quarter 2005, as compared to the previously reported 3.33% for the first quarter of 2004 and 3.30% for the last quarter of 2004. Other income amounted to $19.6 million for the first quarter of 2005, as compared to $20.0 million for the first quarter of 2004. Other income included a net gain on sale of investments net of derivatives losses of $8.4 million for this quarter, as compared to $8.8 million in gains on sale (net of derivatives losses) plus credit card gains on sale, for the comparable first quarter of 2004. Other income for the linked December 2004 quarter amounted to $14.8 million, which included $3.9 million in gains on sale of investments, net of derivatives losses. The efficiency ratio was 40.75% and 39.89% for the three months ended March 31, 2005 and 2004, respectively, one of the best in the industry. An increase in expenses of $9.5 million is mainly attributable to normal costs of operating the Corporation, especially those of its first and second tier subsidiaries, including salaries, advertising and promotions, and occupancy expenses. The Corporation has continued to add personnel in all of its growing business areas. In addition, the Corporation has incurred in higher compliance and audit costs related to Sarbanes-Oxley-Section 404. Total assets were $17.4 billion as of March 31, 2005, as compared to $13.3 billion as of March 31, 2004 and $15.6 billion as of December 31, 2004. Loans receivable increased by 48.6% to $11.0 billion, as compared to $7.4 billion as of March 31, 2004 and $9.5 billion as of December 31, 2004. The largest loan volume increases were achieved in the commercial and real estate portfolios. In addition, loans receivable include $476 million of loans acquired on March 31, 2005, on the acquisition of UniBank. Non-performing loans as of March 31, 2005 were $88.9 million (.81% of total loans), as compared to $85.7 million (1.15% of total loans) and $91.7 million (.97% of total loans) as of March 31, 2004 and December 31, 2004, respectively. Non-performing loans, when compared to the March 2004 and December 2004 quarters, decreased as a percentage of the portfolio. These results reflect a continuation of the decreasing trend in non-performers, which has been experienced since early 2003. The allowance for loan losses to non-performing loans (reserve coverage) was 162.2% as of March 31, 2005, compared to 152.2% as of March 31, 2004, and 153.9% as of December 31, 2004. The improvement is due to the stability experienced in our non-performing loans, resulting in a reduction in the charge offs. The allowance increase is related to the $1.5 billion increase in the Corporation's loan portfolio during this quarter. Net charge offs were $9.1 million (.37% of average loans), as compared to $9.2 million (0.51% of average loans) during the first quarter of 2004, and $9.4 million (.42% of average loans) during the last quarter of 2004. Charge offs have remained stable due to the Corporation's prudent underwriting policies implemented since 1998 and to the gradual shifting of the loan portfolio toward secured loans. On March 31, 2005, the Corporation closed the acquisition of Ponce General Corporation, the parent company of UniBank, a $540.6 million asset size federal savings and loan association, which operates in the state of Florida, and of Ponce Realty Corporation, a $5.0 million realty estate company, which also operates in the state of Florida. With $17.4 billion in assets, First BanCorp is the second largest Financial Holding Company in Puerto Rico. It is the parent company of FirstBank Puerto Rico, a state chartered commercial bank in Puerto Rico, the Virgin Islands and Florida; of FirstBank Insurance Agency; and Ponce General Corporation. First BanCorp, FirstBank Puerto Rico and UniBank all operate within U.S. banking laws and regulations. The Corporation operates a total of 129 financial service facilities throughout Puerto Rico, the U.S. and British Virgin Islands, and Florida. On October 1, 2004, the Bank opened a loan office in Coral Gables, Florida. Among the subsidiaries of FirstBank Puerto Rico is Money Express, a finance company; First Leasing and Car Rental, a car and truck rental leasing company; and FirstMortgage, a mortgage banking company. In the U.S. and British Virgin Islands, the Bank operates FirstBank Insurance VI, an insurance agency; First Trade, Inc., a foreign corporation management company; and First Express, a small loan company. The Corporation's common and preferred shares trade on the New York Stock Exchange under the symbols FBP, FBPPrA, FBPPrB, FBPPrC, FBPPrD and FBPPrE. This press release may contain certain "forward-looking statements" concerning the Corporation's economic future performance. The words or phrases "expect," "anticipate," "look forward," "should" and similar expressions are meant to identify "forward-looking statements" within the meaning of the Private Securities Litigation Reform Act of 1995. The Corporation wishes to caution readers not to place undue reliance on any such "forward-looking statements," which speak only as of the date made and to advise readers that various factors, including regional and national economic conditions, changes in interest rates, competitive and regulatory factors and legislative changes, could affect the Corporation's financial performance and could cause the Corporation's actual results for future period to differ materially from those anticipated or projected. The Corporation does not undertake, and specifically disclaims any obligation, to update any "forward-looking statements" to reflect occurrences or unanticipated events or circumstances after the date of such statements. (1) On a taxable equivalent basis. "The latest Brokers to join this elite network are Scott Andersen of Preferred Properties in Napa Valley, CA, Kermit Brown of Churchill Brown in Oklahoma City, OK, Brent Waldron of Coats Reed Waldron in Aspen, CO, Peter Briggs and Nick Bailey of John Foster, in the US Virgin Islands, Harvey and Elise Kalles of Harvey Kalles in the greater Toronto, Ontario area and Peter Kempf of Peter Kempf International." Rosewood Hotels & Resorts, the premier manager of ultra-luxury hotels and resorts throughout the world, announced that Equis Financial Group and Roebling Advisors LLC, in partnership with Rosewood Hotels & Resorts, have acquired the renowned Caneel Bay Resort from Deutsche Bank. As part of the transaction, Rosewood has entered into a long-term contract to manage the property, and has made an investment in the property. "We are thrilled that Caneel Bay will remain in the Rosewood family of unique and treasured hotels and resorts the world over," declared John Scott, President & Chief Executive Officer, Rosewood Hotels & Resorts. "Rosewood has a deep and long-standing relationship with this historic property and we are dedicated to preserving the service and product that Caneel Bay guests have experienced since its opening in 1956. Caneel Bay, within a 5,000-acre Virgin Islands National Park on the island of St. John, remains faithful to the vision of founder Laurance Rockefeller and to his reverence for the environment." The resort was purchased by CBI Acquisition LLC, whose principal shareholders and investors include, Gary D. Engle, President and Chief Executive Officer of Equis Financial Group, Howard F. Guja, President and Chief Executive Officer of Roebling Advisors LLC, who has been involved with some of the nation's largest residential and commercial real estate transactions, and Rosewood Hotels & Resorts. "For almost 50 years, Caneel Bay has remained one of the most revered resorts in the world and we are honored to become a part of the resort's history," said Howard F. Guja. "We not only look forward to carrying on the long standing tradition of service and style that marks the resort, but also to investing in the resort to ensure that the property enjoys the same success in the coming decades as it has in the past," said Gary D. Engle. Headquartered in Dallas, Texas, Rosewood Hotels & Resorts includes The Mansion on Turtle Creek and Hotel Crescent Court in Dallas; The Carlyle in New York; Las Ventanas al Paraiso in Los Cabos, Mexico; Hotel Seiyo Ginza in Tokyo; King Pacific Lodge on Princess Royal Island, British Columbia; The Dharmawangsa in Jakarta, Indonesia; Al Faisaliah Hotel and Hotel Al Khozama in Riyadh, Saudi Arabia and a triumvirate of world-class Caribbean properties - Little Dix Bay on Virgin Gorda; Caneel Bay on St. John and Jumby Bay on Antigua. For information on Rosewood Hotels & Resorts, call 888-ROSEWOOD, or www.rosewoodhotels.com.